Kenneth, the owner of American Armory, contacted us a few weeks ago in need of a logo design. He also needed to have a professional business card design created along with business cards printed. Our logo design received the information from Kenneth for his colors and general layout for the logo. Within a week, our logo design provided Kenneth several mock-up designs. After just a few small modifications, Kenneth approved of the logo. Our designer then moved on to creating the business card design for him and getting the business cards printed up with expedited shipping. We appreciate the business from Kenneth! Carole, a contact on behalf of the Institute of Linguistic Evidence (ILE), had contacted us about a month ago for website design services. Initially, she was looking to have us create a website for ALIAS Technology LLC, which we previously completed. Carole mentioned that BsnTech further won the business to create a new website for Institute for Linguistic Evidence and another site (which we will be starting soon) because of our excellent customer service, communications, and work ethic. Therefore, we got started on the ILE website about two weeks ago. Carole quickly supplied the information that was needed on each page. Today, the ILE website was fully completed and launched! We appreciate the continued business from Carole and are glad that we are exceeding her expectations with our website design services. 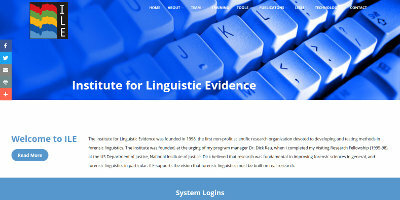 The website for the Institute of Linguistic Evidence is at linguisticevidence.org. I didn’t make a post last week – since nothing ‘new’ really occurred. Same thing this week, but I wanted to provide a post showing the growth of all of the veggies. They are doing quite well! First up – the Copra Onions. In year’s past, I sometimes would cut the onions down. Mixed results on this and some folks said it helps to stimulate root growth. Decided to leave them alone this year. 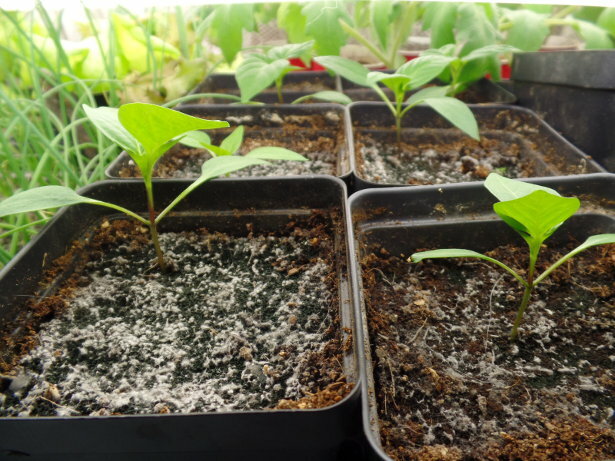 Peppers – After a few weeks, they finally all did germinate. About five seeds were planted in each of the eight black containers. 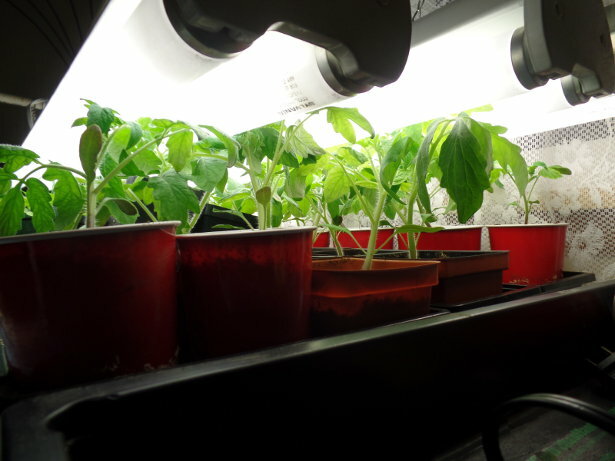 The majority of the containers had two or three seeds germinate. So the seeds had less than 50% germination rate. But it is all from saved seed. Peppers are very easy to save the seeds from and that is a nice feature. Just wait until they are fully ‘ripe’ and when opening up the peppers, a few California Wonder peppers will product dozens of seeds for use the next year. Lettuce – I got lucky! In the last post, I had mentioned that none of the New Red Fire lettuce came up. Well, it looks like it just took an extra week for some of the color to come out. 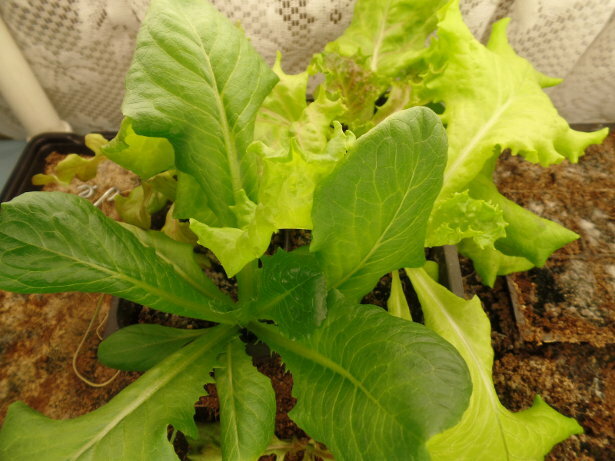 In the photo below, you will see one of the lettuce plants in the back that has a little bit of coloration to it. New Red Fire lettuce is a ‘pretty’ leaf lettuce with the shades of green and purple. 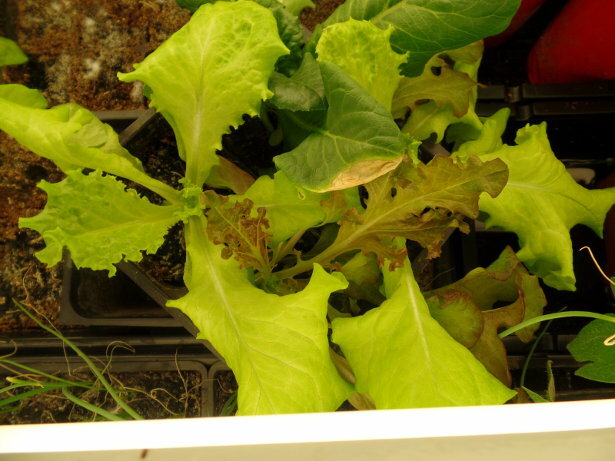 In the photo above, the Parris Island Romaine lettuce is really taking over and trying to crowed the others out! In the photo above, you can see the Red Salad Bowl lettuce towards the center of the picture. It definitely has a different leaf structure than the other ones. Next Up – the tomatoes. 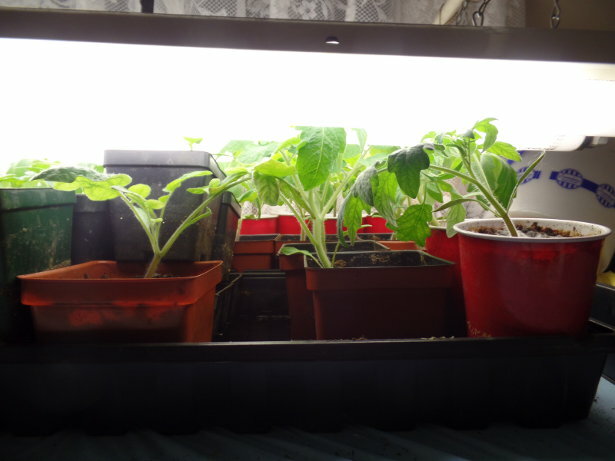 They are growing very well and they have all been divided into separate containers. So, a lot of tomato plants this year. Unfortunately I have mixed all of them together now, so I am not sure which variety is where. I believe there are two Red Cherry tomato plants and then a mix of Best Boy and Roma. Will just have to see what we get this year. Last week, I did get out into the garden and do a little bit of work. I never was able to get the back garden tilled in last year since it got cold very quickly. I spread a lot of leaves over the area and they needed tilled in. After getting that accomplished, the Cascadia Snap Peas were planted. From what I read from the U of I Extension office, they note that peas should be planted in Central Illinois around St. Patrick’s Day. So I planted them about a week later than the recommended time. Either way, I haven’t put peas out this early before, so I am just hoping for the best. Prior to planting, I soaked them in water for about two hours. Then when planting them out, I am usually very picky about ensuring to put one pea seed every inch in the soil. But this year, I made the trench and just let them fall out of my hand. Because the seed is already about four years old and germination wasn’t great last year, I figured it would be OK to overseed them – then thin any out if needed. But a week and a half later, still none have sprouted. So far this year, it has been pretty cool. We have had some days where it has been unexpectedly warm – and then it cools right back down again. The past couple of nights have been below freezing here in Central Illinois. Based on my reminders, the 90% chance of last frost date has already past – but yet we’ve had at least two good freezes since then. 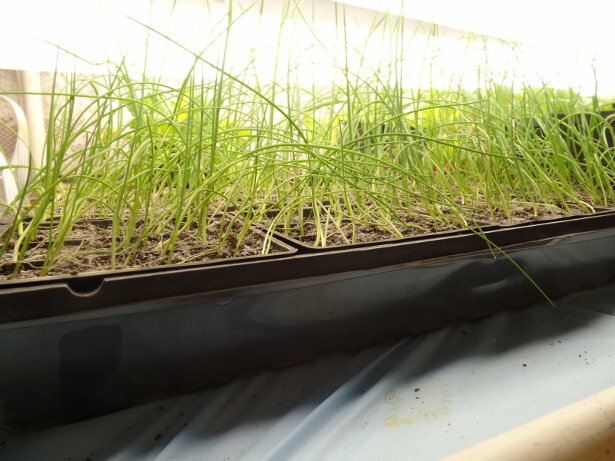 The onions and the lettuce are to the point where they need to be planted outside, but I don’t want to risk them freezing. Danny, the owner of Got Your Credit, inquired with us to create a simple website. His business is taking care of customers looking for automobile loans. The website makes use of a secured SSL certificate to ensure the online credit application is securely transmitted from the customer to the server. The website has a landing page with information about the offerings and one page for the credit application. Once we obtained the info from Danny, we had the website up and running within two days. Today, the site was made live and is open for business! We appreciate the business from Danny. The website for Got Your Credit is gotyourcredit.com. Chol, the owner of C&H RV Park in Moundsville, WV, contacted us a couple weeks ago to get a website made. The website hosting and domain name was already taken care of, and Chol had attempted to already create a website. However, Chol opted to reach out to us to create the website instead. We put together a simple website design for C&H RV Park consisting of three pages. Chol noted that the main purpose of the site was to get employees that work in the oil and gas industries to find the website and setup reservations. C&H RV Park offers RV sites, RV rentals, and Tiny House rentals. In addition, Chol also had us setup Google Places listings for each of the two locations to get found in the local search results. We appreciate the business from C&H RV Park! Their website is at chrvpark.com. Hemant, the owner of Bouncing Fun Rentals, contacted us to create a logo for him. Our logo designer started on the design promptly and gave Hemant several mock-up designs to choose from. After a few color changes, Hemant was happy and approved of the logo. Everything was completed within one week for him. We appreciate the ability to create a vector logo design for Hemant and Bouncing Fun Rentals! Kyle, the owner of Wertman’s Lawn and Landscape, contacted us a few weeks back to create a professional, print-grade logo for his business. Upon initial payment, we sent him the questionnaire which he returned very quickly. Our logo designer then created several mock-up designs to send to Kyle for his review. Upon receiving them, there were just a few changes that he wanted to one of the logos, but he was very pleased with the quality of the design. We appreciate the business from Kyle! D. Sidney Potter contacted us about a week ago asking about website design services. Initially, he was looking for a four page website that provided info about an upcoming book, but we then came to terms with creating a single page website that we felt comfortable with. The four page website that he requested was one of those projects where we didn’t feel completely sure whether it could be achieved. So he decided to look for another possible web designer that could do this website, and awarded us the work for the single one page site. After a few small updates, we had the site done within two days for Sidney. We appreciate his business and look forward to supporting him and his website needs in the future! The web page for The Essayist is at theessayist.net.